Verizon strikers want shareholders to fight for them at the company's upcoming annual meeting. The Communication Workers of America, who have been on strike since April 13, say they will want shareholders to vote to cap executive pay and shares. They also want to require that the board chair be an independent director. CWA spokeswoman Candice Johnson noted that Verizon CEO Lowell McAdam got paid $18 million last year, during a teleconference with reporters on Tuesday. The union is a sizable shareholder, owning about $1.3 billion in company stock. But the shareholder resolutions that the union is voting for are not expected to pass. Verizon's annual meeting will be held on Thursday. The CWA and Verizon have been battling for a month over workers' pay and long-distance work requirements. The union claims that Verizon is skimping benefits while raking in multi-billion dollar profits. Call center employees are angry that Verizon has been outsourcing their jobs to other countries. In particular, the strikers want the company to stop sending them long distances to work at a moment's notice. But the company and the strikers provide conflicting statements as to how far they're expected to travel. Verizon (VZ) spokesman Raymond McConville said in an interview with CNNMoney last month that Verizon would drop the work travel requirement if the union would sign a contract. The company's latest offer included a wage hike of 7.5% and protection from layoffs. As is typical in labor negotiations, both sides are slinging mud. Verizon accused strikers of committing acts of sabotage to its network, while strikers said that Verizon is threatening to cut their medical bills. Yet the strikers claim that they didn't sabotage anything: Verizon's network is crumbling, they say. 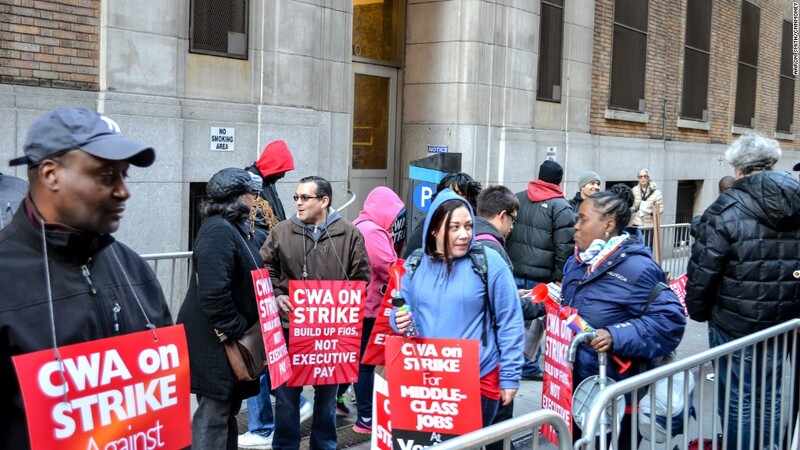 And Verizon said it's not threatening anything: striking employees' medical benefits were suspended on May 1, though they can continue receiving health benefits through Cobra. The union says it's prepared for the long haul, with a pool of $400 million to pay for medical benefits. "We think the prolonged strike will lead to prolonged damage for Verizon," said George Kohl, senior director of the CWA. The union said that several finance firms, including Jefferies, have downgraded Verizon because of the ongoing stress of the strike. Jefferies was not immediately available for comment. "Of course they'd say the strike is taking a toll on us -- what else would they say?" McConville said. "The facts are that our emergency workforce of 20,000 has been doing a great job servicing customers during the strike. Our maintenance load isn't much different than what it was before the strike began." McConville said Verizon has been negotiating in good faith, and "the ball is in their court." Some 36,000 workers have been on strike, in the biggest strike since 2011. But there are others signs that the strike might not last forever. At least 1,300 workers have crossed the picket lines and returned to work, according to Verizon.